Today I traveled to Detroit, Michigan by the way of The Detroit News for May 6, 1963. 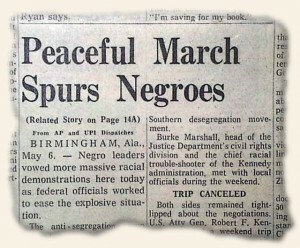 There I found that for the past several days Birmingham, Alabama, has been witnessing the “Children’s Crusade”, in which several hundred students had skipped school to march for desegregation and civil rights. Today’s report states it was peaceful with singing, chanting and praying as it was Sunday. Oddly enough the only arrest made (as of this article) was of a white couple inside the church as they were not permitted inside the church. Also in the paper was a headline “Found Hitler’s Body in ’45, Reds Say in War ‘Secrets'” which also included a large photo Adolf Hitler and his wife, Eva Braun. This was information being released about the disposition of Hitler’s body from the release of a book by Cornlius Ryan entitled “The Longest Day”. Did you ever want to be the life of the party? There is a story of a 15-year-old boy that, with a novelty ring, “touted to possess ‘hypnotic’ powers”. Well, within a few minutes, he truly ended up placing a young lady into a trance but was unable to get her totally out of it. A call to her parents, a trip to the hospital, and a psychiatrist later, the trance was broken. Just be careful at your next party with your jewelry and what you say! Snapshot 1934… Adolf Hitler declares he will not go to war!